Found this useful and thought others might also. 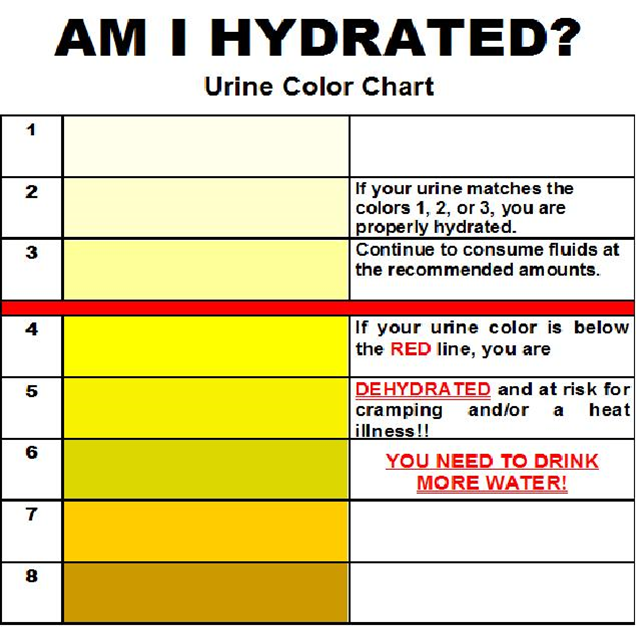 Charts to print and post above every urinal to help players monitor their hydration levels. Also hydration weigh in and weigh outs. The players weigh themselves and post their weight pre-practice. Following practice they weigh out and record the weight. This helps trainers monitor each player and helps players see how much they are sweating out each day during pre-season camp. We also picked up this explanation about how to hydrate. When a flash flood hits the rain is an intense downpour for a short time. The rain is coming down so fast it doesn't have time to soak in. Most of the water pools and runs off. After this type of rain storm the ground isn't saturated. A slow soaking rain is a slower consistent rainfall over a longer period of time. When it rains all day, the rain soaks in and saturates the ground. Chugging water is like a flash flood. The human body can only absorb so much water per hour (approx. 8oz). All the extra water is urinated out. This effect can also fool players into believing they are hydrated. If you chug 20oz of water, 12oz will be urinated out. When that happens the urine will be mostly water and appear in the hydrated zone of the chart above even if the athlete is not fully hydrated. Slow soak is a better strategy to hydrate. 4-8oz every hour all day long will result in more absorption. This also helps players use their normal urination cycles to monitor their hydration levels. We are all always looking for little ways to help players stay safe and perform at their best. Hopefully this helps us stay strong in the heat. Here are two ways the Saints got a safety involved in pressure last season. End & DT to the pressure working a twist. The DT is up the field penetrating the B Gap with the DE wrapping to the A gap. The Away DE and DT are working a normal pass rush with the DE containing and the DT with a 2 way go on the Guard. Cover 1 man free. The Mike and Dime are both walked up into the A gaps. The Mike falls off on the snap to man cover the RB. The Dime runs out at the snap to replace the blitzing safety. The pressure pattern is a common pressure pattern found in many defensive playbooks. What makes the pressure work is two factors: the Double A gap bluff look and the utilization of a Dime personnel. The double A gap look forces the 5 OL and RB to be occupied with immediate rush treats. The Safety is not a primary threat and is less threatening in the look which allows his pressure to surprise the protection. With the blockers all focused on initial threats the pressure is home before the protection can identify who is actually rushing. The Dime personnel allows the coverage to work. This look is possible from a nickel personnel. Asking a LB to run out to man coverage is a big task. Asking a Dime DB to run out to cover a #2 is both possible an effective from a Dime personnel. Cover Zero man coverage with the Safety hug rushing the RB. When the RB blocks the Safety adds to the rush. The pressure pattern is again a common concept found in many defensive schemes. Most teams carry a standard Double ILB B gap pressure in a nickel personnel. However, the decision to use a Dime personnel instead again greatly increases the effect on the protection. The usage of Dime f manipulates the protection. The offense declares the 4 DL and the Mike backer as the primary threats. This makes sense as those 5 are the closest to the LOS and most likely to pressure. The 2 Deep shell further reinforces the the OL's decision to handle those 5 threats as primary. The deep Safety blitzing is not an obvious rush threat which again allows him to catch the offense off guard.The hug rushing Safety occupies the RB by entering the rush. The result is an unblocked blitzing Safety in the B gap. These are both creative ways to use Dime personnel to get greater productivity out of tried an true pressure concepts. What is the difference between personnel and spacing? As there is no universal football terminology, I'll start with how we define these terms. Personnel is the people on the field. If we want to substitute a player into the game because that player has a skill set for the job at hand, we can do that with a personnel group change. Need an extra DB, sub one in with a new personnel group. Need your best pass rushing DL on the field, sub them in with a personnel group on 3rd & Obvious Pass downs. Bottom line Base personnel subs out for a specialized personnel group. Could be a a 1 for 1 sub or a mass substitution. Spacing is how the defenders line up. Can a 3-4 personnel space like a 5-2, 5-3, 4-3, 4-2, or 3-3, yeah absolutely. Can a 4-2-5 with a hybrid player at DE morph into 3-4 concepts, definitely. As a defense, we are not bound in any way by the idea that personnel dictates spacing. If we have versititle players, specifically hybrid DB/LB or LB/DL we can play any number of spacings with the same personnel on the field. Got a sub group of elite speed rushers, great, create a 3rd down specialized pass rush package and go sic 'em. But what if your best 11 are just that, your best 11. This is where spacing and align to win come together to help create specialized pass rush opportunites with base personnel. Take a base 3rd down pass rush alignment. The DT's widen to work pass rush against the guards and the DE's are outside against the OT's. If the DE's are the best rushers and the guards are the weaker protectors it's possible the offense has exactly the matchups they want (G's vs DT's and OT's vs DE's). With a simple call the defense can instead flip the DL alignments. This is still a 4 man front spacing with new roles for the DL. Now the interior OL has to contend with the better rushers. The DT's soak up the better pass protectors on the outside. The DT's likely can align with width and keep contain. This alignment also lends itself to still running pass rush games. Ultimately this stunt gets the DE back out to the outside. Maybe the defense wants to attack a specific side of the protection. Again a front adjustment can help. Nothing says the defense cannot align with both DE's on the same side. The DT's can contain and build a backstop opposite the Ends. The DE's can now work base pass rush or pass rush games and attack the weaker side of the protection. Another option is to build an X rusher package. The idea is simple if you have a good rusher to sub you can sub for the X. If you don't you use your base 4 DL as the 3 down linemen and declare one as the X rusher. Who should be the X? Possibly the best rusher because the X can align anywhere and has good rush opportunities. Is is also possible to use the 2nd best rusher as the X. This allows a slightly lesser player to get and advantage in the rush and have the best chance to succeed. Meanwhile away from the stunting X can be the best rusher working in isolation. The X can align off the edge and rush like a OLB type pressure. The X makes an Edge Left or Edge Right call to declare where he is aligning and rushing. The front works away from the X's call. The Nose and DE opposite can also work pass rush games to create good matchups opposite an edge call. The X can walk up an isolate the Guard with a two way go. Again the Nose and End opposite the X can work base pass rush or a rush game. The X calls Gilligan Right/Left. From the same X on the guard alignment the X can work pass rush games with the End or the Nose. Against sets with the RB set to the boundary or other drop back pass indicators the X calls Gilligan to the weakest OG. But against sets with a threat of sprint out pass the X calls Edge to the sprint out threat. With a little planning the defense can be in a best rush situation with a simple set of weekly rules. A defense can easily build multiple pass rush stunts by aligning the X rusher where ever the defense wants. The spacing choices are endless. X can line up as a Stack LB, 2 point or three point, stem around pre-snap, blitz into the rush, etc. The X package can be a way to get great spacing multiplicity without subbing new personnel. The defense can easily use the X package to also build in various 5 man pressures and 6+ blitzes with the multiple spacing options of having the X rusher anywhere. When thinking about aligning to win, the defense has no rules about # on the LOS or structure of our alignments. Why does our best pass rush DE have to line up on an OT? Defending and aligning to multiple TE formations - The NFL has basically every variation of 12, 13, 22, etc. going on in nearly every formation possible. Being prepared for these types of heavy personnel groupings is important. I’m always on the hunt to expand and improve our multiple TE defensive calls in the playbook. Unbalanced formations – NFL defenses see many unbalanced formations from nearly every personnel. Having a good unbalanced plan is important to avoid getting caught with limited answers to unbalanced. Reduced splits – Many of the offensive formations in pro football have reduction of splits. Defenses are forced to have answers for 2 man stacks, 3 man bunches, TE/wing structures, etc. Motions & Shifts – NFL teams trade, shift, and motion all over the place from every formation. Including shift & motion in heavy personnel groups, to/from unbalanced, and into/ out of reduced splits. Drop back pass protection – The NFL has every kind of pass pro. 5, 6, 7, 8 man concepts with every adjustment possible in their arsenals. Also pro teams use TE’s in the pass pro more often than college. TE in pass pro is a concept that is important to study and understand in case we need more answers to attack it. Creating pass rush opportunities - NFL teams are really good at attacking protection schemes. Pro defenses are also very good at creating 1 on 1 opportunities for their best rushers. Definitely good ideas to pull from for any defense. Disguising Base Concepts - NFL teams do really well at disguising concepts they run all year long. Each week defenses spice it up with a new pre-snap presentations but still run a tried and true defensive concept. Studying one defense's full season of work in the offseason can be a big eye opener. Over 16+ games a defense may run the same blitz pattern multiple times but each week from a different pre-snap alignment or presentation. Really good ideas for getting more mileage from a defense's best calls are on display. Simplicity works - Watch the Pete Carroll coaching tree. They play 1 high safety concepts and play them really well. They aren't trying to fool, they are trying to out execute. Pro Players Screw Up Too - Pro players bust assignments, commit eye violations, and make all other kinds of mistakes. Double Coverage – The NFL is full of hi/lo and in/out double team concepts to cancel a star player or at least limit him. These concepts apply at all levels. How do we take away their best guy? #2 How would you apply this concepts on the Blitzology site to youth football? The most direct answer is frankly I wouldn't. I would focus on fundamentals of defense: block shed, pursuit, and tackling. I see all the time the quote "Culture beats Scheme" but it is just as true that "Fundamentals beat Scheme"! As for the scheme I would seek guidance from the Junior High/High School those youth kids will play in next about what to run to build the foundation for the next levels. Also I'm confident no youth team needs 4 from a side simulated blitz back stopped up by a double rotated zone coverage concept to manipulate the pass pro and QB read progression. Just saying. Don't worry more Align to Win is coming soon! Stack spacing allows for all kinds of interesting and effective pressure concepts. One classic 3-3 pressure is to bring the stack backer and Mike to the same side of the center pressuring the inside gaps. This pressure has been around for a long time. Unfortunately the pressure is easy to pick up in a half slide pass protection. The Center and Guard are in good position to see and block the Sam and Mike. The Will can green dog the RB and generate pressure that way. Ultimately this concept comes down to personnel and who in the pass rush can beat a blocker. One way to improve this pressure's effectiveness is to add a read concept. As opposed to the previous 3-3 read concept that attacked the RB's alignment, this concept attacks the slide side of a half slide protection. The concept is similar but the read elements to the rush create opportunities for the Nose, Mike, and Sam. The pressure is set away from the back. If the back was aligned to the Sam, the Sam would green dog and the Mike and Will would be in the pressure. Cover 1 with the non-pressure LB using a green dog technique on the RB. This could also be a 3 under 3 deep fire zone coverage. Mike - Guard away, wide in the A gap and stack the guard. Inside rush lane. The Mike and Nose both widen in this situation to create the midline rush lane for the Sam. Sam - Attack the wide B gap. If the Guard sets to, wrap to the midline rush lane. The goal here is to create a twist action with the Mike and Sam. If the Mike penetrates the A gap and stacks the guard, the center is forced to set deep and commit to blocking him. When the Sam wraps to the midline the center has difficulty passing off the Mike and picking up the Sam. If the offense decides to slide the protection to the alignment of the RB the pressure still works. This also works if the offense is flipping the alignment of the RB late in the cadence. Read pressures can help defenders to win in the pass rush by creating win/win pass rush opportunities. Most 4-2-5 coaches are familiar with the concept of split field coverage. Get your DB's to call the coverage on the field and put your defense in the the best coverage available vs. the formation the offense presents. The formation is split in half and the safeties call the coverage for their half of the formation. One popular quarters coverage trips adjustment has the safety away from trips work strong side to help with #3 in the 3x1. Some call this concept Poach (Saban/Belichick/Smart) or Solo (Patterson). The name is really not important. The concept is simple, vs. a 3x1 formation the the coverage adjusts with the backside safety. To the 3x1 the Corner, FS, and SS play a quarters concept just as they would vs. only 2 receivers. The LB to the 3x1 drops to #3 handling all low routes. The WS works to #3 and handles all vertical routes. The Corner and LB to the single WR side match the X receiver and RB in coverage. One simple adjustment to get more pressure in passing situations is to exchange the roles of the weak side DE and Mike LB. The Mike and Nose are reading the turn of the protection by keying the Center's block. The DT plays B gap and pops to contain. If the Center blocks to the Nose, the Nose widens and handles the inside rush lane. The Mike stays on his A gap rush and should expect the RB's block. This situation keeps the RB from free or check releasing to get into a route. If the Center blocks to the Mike, the Nose keeps penetrating and takes the opposite inside rush lane. The Mike attacks the A gap and reads out when the Center blocks toward him. The Mike wraps around the penetrating Nose to the opposite inside rush lane creating a twist action. If the Center is blocking toward the Mike, the guard is forced to chase the penetrating Nose. The Mike's wrap timing is critical. If the Mike goes too early, the Center/Guard can see the twist. If the Mike's timing is correct, the Nose has stacked the Center and the Guard is committed to the Nose allowing the Mike to wrap and create pressure. With a simple tag word we can have a pressure trips check in our split field coverage concept. The 3-3 stack spacing has many options for both blitzing and bluffing pressure. One of my favorites vs. 10 personnel is a read pressure. The rush reads the turn of the protection and adjusts to give the rushers the best possible rush opportunity. The pressure is based on the RB's alignment. If the back was aligned on the other side the roles would adjust. Sam - If the Guard blocks down Run through in the B gap. Expect the block of the RB. Inside rush lane. This is a situation where you can really turn up the heat by going Cover 1 instead of Cover 3 fire zone. In a Cover 1 situation the Mike can use a green dog technique to overload the the RB. Both the Cover 1 and Firezone versions have applications. When the turn of the protection is toward the RB the pressure adjusts. Sam - Guard to you, wrap to opposite inside rush lane. We want the Sam to initially attack the guard then wrap. Wrapping too early disrupts the timing with the Nose and Will. This pressure could also be set away from the RB. By doing this the defense will likely get the 3 man twist action to attack the slide. Allowing rushers the opportunity to read and adjust the rush can help in a number of ways. #4 Helps players develop the "be a playmaker" mentality. We want our guys to understand they are not simply "running calls" they are making decisions that either help themselves or hurt themselves in terms of playmaking and production. We are constantly working to coach the mindset of "I'm blocked" out of players. The opportunity to produce within the scheme is there on every play.